6" Slatwall peg hooks are perfect for small to medium items or products. Your customers will love being able to see what they are buying. Whether you're storing items in your stock room or setting up a display on your showroom, the 6" slatwall hooks will allow you to keep things neat and orderly for more efficient restocking. The 6" reach out will help to increase the open space in your setting. The black finish has a look that will appeal to your customers, while matching any display slatwall finish. In stock and available for immediate shipment. The product was just as I expected. However, the service is above average! When there was an issue with UPS returning my entire order to SSW, their customer service department was very understanding and accommodating, sending it out again quickly and without additional charge to me. I will definitely order again! These hooks are a simple way to showcase my products. And when I need more I am always amazed at how quickly my order arrives. These are fantastic! Very durable and easy to use. We use them to hold purses and wreaths. They are wonderful and extrememly inexpensive! These slatwall hooks are well constructed and sturdy pieces. They hold the merchadise without breaking. These hooks are very sturdy. I hang some pretty heavy toys from them and have never had a problem with failure. I ordered my hooks through this company. They are quick to ship. They also have really good pricing. I also think that they have great customer service. I will continue to buy. Plus the product is durable and with last a long time. Good sturdy hooks and work great with the slatwall. Totally happy with these slatwall hooks. I expected a cheapo version for the price, but was very pleasantly surprised. They're great! Store Supply never lets me down! Great quality products at a fabulous price. I won't shop anywhere else. We have not found better prices even with S/H. Way to go Store Supply Warehouse! Love the black and am gonna need to order lots more! well, these hooks do the job, the color black on a beige slatwall looks very elegant. 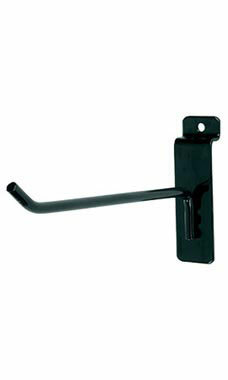 sturdy hook that has a nice finish and is easy to relocate. I love these for hanging jewelry on my slate wall!